Due to the promise and success of biobanking and translational medicine, millions of people with a variety of conditions will someday be able to access better treatments that will improve their prognoses and quality of life. However, a smaller but prevalent number may be unable to experience these benefits due to reactions or resistance to certain drugs. Because of this, the Mayo Clinic is collaborating with Baylor College of Medicine to study 10,000 of the donors in their freezer inventory to check for these potential problems. Researchers plan to sequence the DNA of these patients for 69 different genes that can influence metabolization and reactions to different medicines, a project that could improve both treatment protocols and biorepository management. Biobanking is a huge international industry that is only continuing to grow with time: research shows that nearly two-thirds of biobanks were established within the last decade, while only 17% have been in existence for over 20 years. 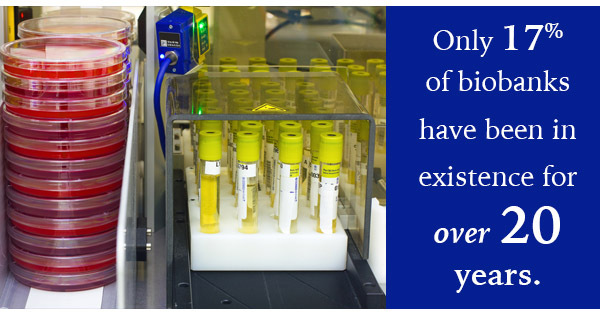 This rate is consistent with an increasing number of samples stored in the facilities, with reports estimating that there were 300 million tissue samples stored in biobanks in the U.S. alone at the turn of the century, a figure that is now increasing by 20 million a year. Many of these research centers have a specific goal in mind, with 53% of biobanks listing research on a particular disease as the most important reason for their establishment. However, of the more general biobanks, the Mayo Clinic’s facility is one of the best known and well-reputed research centers, focusing on a variety of conditions with genetic causes. Now, the organization is turning its expertise and biorepository software towards a common problem: drug reactions and resistance. In the new study, Baylor’s Human Genome Sequencing will sequence the genomes of 10,000 patients, beginning with a 500-person sample pilot program to refine the testing process before moving on to the samples from the 10,000 patients. Once the data is sequenced, the Mayo Clinic will integrate the data into their electronic health records with their biorepository software and analyze the results. Over the course of this process, both organizations will also study the sequencing data to identify novel genomic variants and hopefully find ways to improve the way patients are tested for drug reactions and resistance. To further the potential benefits of the study, the Mayo Clinic’s Center for the Science of Health Care Delivery will also be analyzing the results to see if pharmacogemonic DNA sequencing and data actually improves patient care. While the program is in its infancy, its researchers have stated that the program has the potential to help bring pharmacogenomics into patient care, possibly preventing serious errors and identifying the best drugs and individualized treatments for thousands of patients. This impact is largely due to the Mayo Clinic’s extensive collection of DNA samples and complete de-identified medical histories, which are stored in the biobank’s biorepository software. Will the project be able to reduce the complications associated with drug reactions and resistance? Only time will tell.